Everyone is looking to save money on energy bills these days, and you're probably no exception. If you have a gas fireplace, there's a quick fix you can do that will save you a few dollars a month on natural gas. 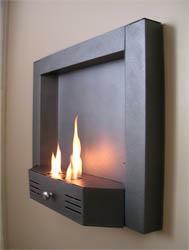 Most gas fireplaces are installed with pilot lights that are on 24/7. If you convert these standing pilot lights to on-demand pilot lights that fire up only when necessary, you can save $10 or more every month. If you dig the look of those chimineas (Mexican fireplaces used for outdoor cooking and all-around fireplace enjoying), now you can have one inside the house. Now, you'd need a chimney that vented to the outside if you were putting a fire pit or wood-burning chiminea indoors, but a couple manufacturers are starting to make gas chimineas. So, it looks just like the outdoor ones you've seen, but these use vent-free gas fireplace technology to make them perfectly safe to operate indoors. An example is the Natural Gas Indoor Chimenea from Yardiac.com. "The Superb indoor vent-free grape-leaf Chimenea offers ambiance and durability with the rugged cast iron body. CSA certified for indoor use only, the indoor model offers 20,000 BTU's of comfort with dedicated LP and Natural Gas models. The indoor Chimenea offers an oxygen depletion sensor and millivolt controls, and is remote capable." An indoor chiminea would be great in a house with a southwestern theme. The one shown here costs just under $1,000. A ventless gas fireplace is a fireplace option you have if you'd like to enjoy the heat and warmth of flickering flames but your home doesn't currently have a chimney and you don't want the cost of installing one. Even if you have a chimney, you may like the idea of a fireplace in the bathroom, midway up a wall, or tucked into a corner, places that are traditionally not accessible via chimney. The cool thing about ventless gas fireplaces is they can be installed just about anywhere. Since they don't require venting to the outside of the house, they are easier (and less expensive) to install than regular gas units or traditional wood fireplaces. Today's models are very fuel efficient, with 92%-99% of potential heat converted into usable heat. Ventless units are designed to produce a hot flame, which results in almost full fuel combustion, a benefit that reduces the amount of carbon monoxide emissions and soot produced. Ventless gas fireplaces are considered safe for homeowners because they include an oxygen-depletion sensor that turns gas off before carbon monoxide reaches dangerous levels in the room. A big downer is that in some states, ventless units are banned because they don't meet all building codes. There are debates on the effects on indoor air quality. While manufacturers say their units meet or exceed all indoor air-quality guidelines, some people worry about fumes vented into the home as opposed to outside. Water vapor from the fire is vented into the home, which may cause condensation on windows, or in the long-term mold/mildew issues. While costs, of course, vary a lot from model to model, the general range is $800-$2,000 installed (gas-line work not included in estimate). What Is an LP Gas Fireplace? If you're shopping for a gas fireplace, you may have seen fireplaces that burn "LP gas" and wondered what it was. Gas fireplaces are traditionally installed in homes where natural gas fuel is available. You have an existing line or are able to get one installed. But if you live in an area where that's not an option, LP gas is a possible solution. LP is short for liquid propane. When propane gas is compressed for storage, it becomes a liquid. You've probably seen the tanks hooked up to gas barbecue units before. LP gas fireplaces run on the same fuel. Unlike other types of gas fireplaces, the ones that run on LP gas can be portable, so this can be a way to go if you want an outdoor firepit that you can take with you but which doesn't burn wood. With an LP gas fireplace, you may be concerned about running through the tanks quickly and constantly having to replace them. If you plan to use your fireplace a lot, this is something to think about. Here's an article over at Chimney Sweeps Online that discusses how quickly a gas fireplace will use up a tank of propane gas. Some of the obvious advantages of installing a gas fireplace are that it's a lot easier to simply turn it on than drag in firewood and start a fire. Plus gas fireplaces don't produce smoke and other byproducts that can be hard on people with asthma or who are just sensitive to air pollution. There are some other advantages, too, as outlined by this Gas Fireplace Fact Sheet. For instance, gas fireplaces are easy to maintain (no sweeping up ashes, thank you very much) and can be an effective way of zone heating your home (this is when you just heat up the rooms you're living/working in as opposed to turning up the thermostat to have heat kick in all over the house. They can be pretty inexpensive compared to wood-burning fireplaces too (depending on the area where you live, gas can cost as little as 25% of the price of buying firewood). For more information on gas fireplaces, check out the original article: Gas Fireplace Fact Sheet. There's still plenty of time to buy a gas fireplace this winter, if that's something that's been on your mind. You can order one online (though you'd still have to arrange for someone to install it for you) or shop from one of your local retailers. But how do you choose a gas fireplace model that's just right for you? Choose a direct-vent gas fireplace for safety and efficiency. Buy one with an automatic starter instead of a pilot light. Choose a model with a "squirrel cage type" circulating fan. They're quiet and push more heat out into the room. To get even more heat, consider a model with a secondary heat exchanger. Consider a model that can be connected to the ductwork if you're interested in using your gas fireplace to heat the whole house. For more tips and information, check out the original article. Lighting the pilot is pretty much the same process with all gas stoves: depress the ON/OFF/PILOT knob slightly and turn it to the PILOT setting. Next, push in on the same knob with one thumb while clicking the piezo igniter button repeatedly with the other until the pilot lights (the thumb pressure holds the gasline open until the pilot flame can heat up the thermopile, so you need to keep the knob depressed for about 45 seconds, so the thermopile has time to start generating before you can let go of the thumb pressure). If the pilot goes out when you remove your thumb, it means the thermopile didn't heat up enough to hold the gas line open, so wait a couple of minutes and repeat the process until the pilot stays lit with your thumb removed. Once the pilot remains lit when you stop depressing the knob, turn the knob to the ON position. Now you can light the burners with the manual switch, thermostat, or remote control unit. Also check to see if soot has formed on the logs or windows. If this is the case, you should check with your gas supplier to find out if the composition of the gas has changed. First, turn off the gas and electrical power and let your fireplace cool down. Remove the logs/stones/coals and the burner. Take them outside and with a soft-bristle nylow brush, clean them off. Similarly, scrub out the firebox and vacuum the dust. Turn off the pilot light and use a dry cloth to clean the pilot nozzle plus the burner asseembly. Before reassembling everything, turn on the pilot light to make sure it's burning properly. While you have your unit open, inspect the vents and make sure they are clean and clear. Use a non-ammonia-based household cleaner to clean the viewing glass. Lastly, replace the logs/stones/coals and burner to their exact location. Turn the power and gas back on and flick on your fireplace. Make sure the fire burns well and that you don't smell gas. Just because winter is on the wane doesn't mean you can't go shopping for a gas fireplace. In fact, this is the time of year where dealers start to offer sales to move "last year's models." How much do gas fireplaces cost? You can get a basic unit for around $800. From there, they can easily go up to four or five times that amount, depending on the size, type, style, and trim packages. Gas fireplaces also come with numerous optional accessories these days. Examples include mantels, built-in bookcases/entertainment centers, and of course remote controls and wall switches. As with any kind of shopping, it's a good idea to know what you want before you go into the store, and don't get tricked into buying a bunch of accessories unless you really want them (a remote control can be handy, especially for a gas fireplace installed in the bedroom). It's also a good idea to do some comparison shopping around the Internet to find out prices for the models you are looking at. In the end, though, you may want to buy from a local dealer, who can include the cost of installation in the deal. Vented vs. Ventless Gas Logs--What's the Difference? "Vented logs have been available for more than 20 years and are the most popular type of gas logs, probably because the flames they produce most closely resemble a real wood fire. They burn a yellow flame, and many include glowing embers, which further add to the realism." 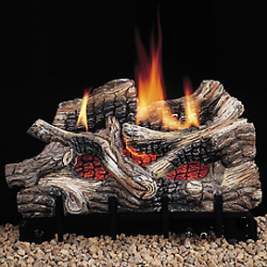 The author adds that vented logs tend to look very realistic and even have touches such as pinecones, branches, and live-looking embers. The important distinction to remember about vented logs is they must be used "only in a wood-burning fireplace with an open damper, which allows the heat to flow upward and out of the chimney." Ventless logs, on the other hand, do not need an open flue to the outside. "Because ventless logs can operate in a fireplace with a closed damper, they are very efficient and more economical to use than vented logs. These logs can create a great deal of heat, so wooden surfaces above the fireplace, including mantles and shelves, may have to be protected or removed." The article adds that there are some cosmetic differences between ventless and vented logs too: "Ventless logs also burn with a yellow flame and have glowing embers, but they tend to look less realistic than vented logs. Ventless log sets do not allow for the addition or repositioning of logs or branches." To read the whole thing (which also touches briefly on gas fireplace inserts), check out "Gas logs, fireplace inserts offer cozy fire minus mess."